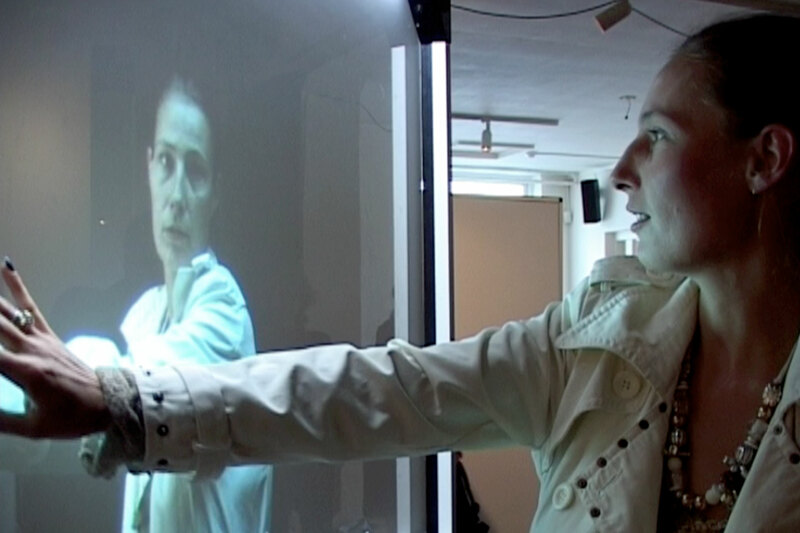 Produced: in the context of an artistic residency at the Netherlands institute for Media Art. Frontera consists of two main components: a playback screen and videobooth. The playback screen: A randomly chosen character observes the spectator from a glass screen. From his pose and the framing of the shot, he seems to be waiting to be portrayed. The character will carry on like this, breathing and blinking, until the spectator touches the screen. Then, he will come out of his immobility responding with the same gesture, placing his hand and gaze on the user’s hand, following any route it follows. Trapped in this small sequence of gestures the portrayed character meets the present one at an instant of simulated communion, which expresses both the will for communication and the impossibility of it actually happening. The videobooth: After interacting with the portrayed character, some spectators will probably wish to become themselves part of the work by being portrayed. The videobooth was created to serve this purpose. This videobooth looks as a large photo booth, but it records video instead of taking pictures. When inside the booth, the user has to perform a set of movements in a game-like environment. Frontera’s program then turns the resulting video sequences into an interactive portrait. After completing the recording session, the user is able to play with his image, or allow others to do so.